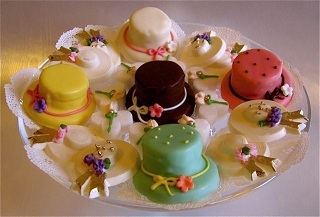 Inspired by commercially baked cookies, Easter Egg Tea Sandwiches and Spring Bonnet Petit Fours are easy to create by simply using whipped cream cheese, pound cake, and buttercream icing as your base with oval and round cookie cutters for your shapes. Begin by cutting out the bread slices, using either a cookie cutter or scissors, into oval and round shapes of various sizes. Place the white whipped cream cheese into eight (8) separate bowls (1/4 cup whipped cream cheese per bowl). Each separate bowl will be used for a different color. Using USDA approved food coloring, place one (1) drop of coloring at a time into a bowl containing whipped cream cheese. Mix together until you achieve the desired shade of coloring. Repeat for the other colors you desire. Prepare the garnishes you desire (see above for ideas). Using a small spatula or flat knife, spread the base color of the whipped cream cheese across the top of your bread. Decorate the open-faced tops of each sandwich. Coat the bottom of a small frying pan with butter and let melt until just lightly brown. Add the eggs and scramble. Place a heaping tablespoon of scrambled egg onto the lightly-toasted bread rounds. Top with a dollop of caviar and serve. Place eggs in an empty saucepan and cover with water. Bring to a boil and cook for 5 minutes. Turn heat off and allow eggs to sit for 10 minutes. After 10 minutes, remove the eggs from the water and allow the eggs to cool down. When read to peel, place eggs on a dry paper towel and roll to crack the shells; remove shells. Either chop or grate the eggs into a bowl. Add the diced olives, mayonnaise, Dijon mustard, vinegar, salt, pepper, dill weed, and paprika; mix together. 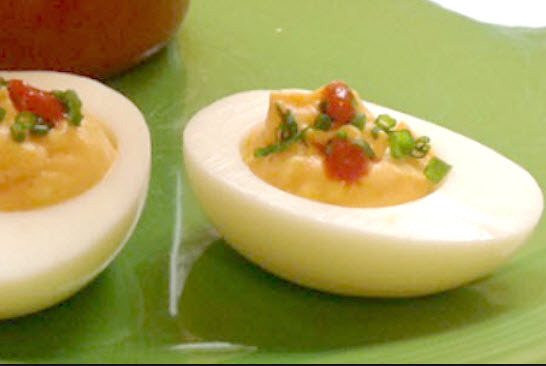 Deviled Eggs Spread may be stored in the refrigerator, in an airtight container, for 3 days. The above sandwich spreads can also be used in making these interesting Pinwheel Sandwiches. Using a sharp knife, cut the crust off the bread. Using a rolling pin, roll the bread slices until the thickness becomes thin. Place the spread (of your choice) on one side of the rolled bread. Place topping of your choice on top of the spread. Roll up lengthwise and cut horizontally into finger-size pinwheels. For a long cigarette roll, do not cut the bread. Ends may be dipped in chopped nuts or diced greens. *I recommend using a frozen pound cake to create this Easter bonnet. Cut out the shapes while the cake is still frozen. Place the white buttercream icing into eight (8) separate bowls (1/4 cup buttercream icing per bowl). Each separate bowl will be used for a different color. Using USDA approved food coloring, place one (1) drop at a time into a bowl containing white buttercream icing. Mix together until you achieve the desired shade of coloring. Repeat for the other colors you desire. Using a small spatula or flat knife, spread the base color of the buttercream icing across the top of your pound cake cut outs. To create the top piece of the petit four hat, repeat the process on the smaller round and then set it on top of the larger round. Note: If frosting the cakes, frost each cake individually before setting the small oval on top of the round. Once the cake is assembled, decorate the top and the brim of the bonnet with colorful fresh berries, a sprig of mint, colored sanding sugar, sprinkles and/or crystallized flowers. For dots use blueberries. For stripes use julienne strawberries. To create a lace bonnet, spread with buttercream icing and sprinkle with shredded coconut. Add a dash of color with lemon and orange zest or colored sprinkles. Add a sprig of mint to replicate a bow. To serve, place each mini bonnet on a lace paper doily. Sprinkle jelly beans on the platter or table for an extra treat. 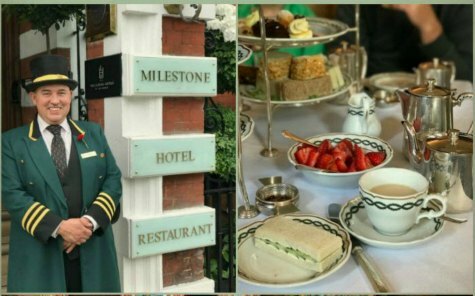 Tea Travels!™… photos and recipes by Ellen Easton 2011 – All Rights Reserved.